Sustainability is a goal that Schmechel gladly sought. Customers can share this objective. Additional axle for higher payload. While using trucks, Schmechel is already able to reduce the environmental impact by introducing the latest generation of trucks as early as possible. A large contingent of Euro 6 trucks is already part of Schmechel’s fleet. These engines emit even less pollutants than previous engines. Schmechel aims to cut its fuel consumption even further. It has been possible to cut fuel consumption by trucks by almost half compared to thirty years ago thanks to constructive solutions from truck manufacturers and in-depth orga­nisational activities at Schmechel. 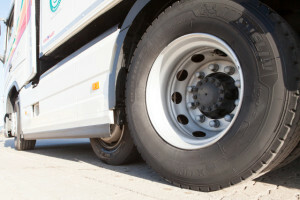 This result has been reached by constantly controlling all factors which impact fuel consumption, as well as driver trainings and use of high-quality, abrasion-resistant tyres which offer opti­mum friction. Limiting maximum speed to 85 km/h has also helped to achieve these excellent consumption figures. Economic savings have long since been used up in this process, because extensive construction methods to achieve ambitious consumption and exhaust values call for increasingly higher investments – and thus trucks being more expensive to buy. The use of urea additives (ad-blue) is also constantly resulting in additional costs for truck owners. Together with increasingly interested customers, Schmechel optimises trans­port requirements from an ecological perspective. The use of double-deck trailers reduces tonne-kilometres, as do combined transports in various temperature zones in a single truck. Clever combinations of shipments from a single shipper using so-called ‘milk run’ trips and using consolidation hubs are other instruments to be used to reduce a forwarder carbon footprint. Special gate solutions for the new warehouse using so-called load houses reduce thermal bridges as well as space required in the warehouse building. Heightening awareness of ecological latitude among shippers, recipients and at forwarding companies and their employees is a never-ending task for internal training, in order to recognise and use the latitude available for activities. Schmechel's employees are highly motivated and our current management team aims to exploit all of the ecologically demanding opportunities to structure our journey into the future responsibly.